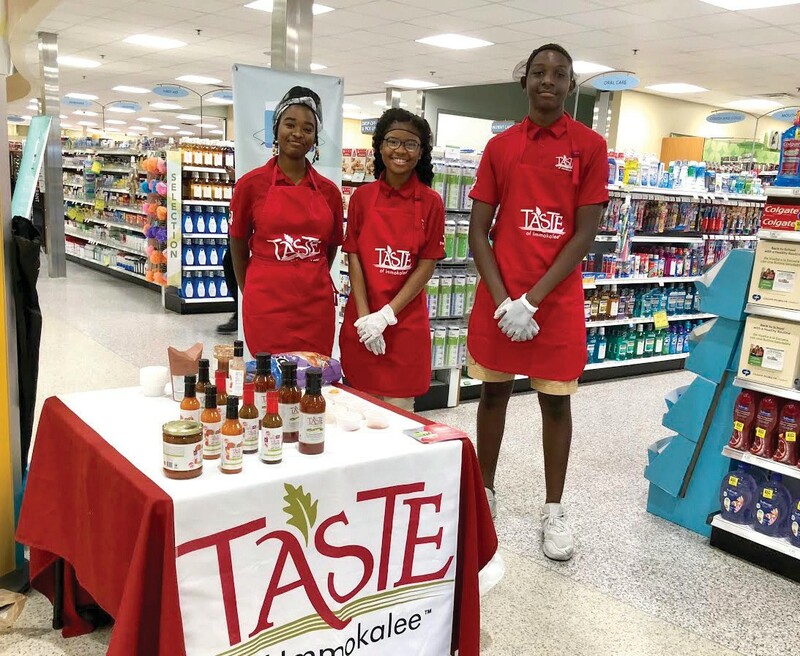 For the past four years, students in Immokalee have been overseeing every aspect of a business start-up selling salsa and hot sauce, and giving a portion of the proceeds back to the community. This year is the first time those students can say that the produce used for the Taste of Immokalee line, which now includes two new products, was also grown in local fields by local workers. The six different salsas and hot sauces are now sold in each Publix store in Collier County. On a Saturday in August, Dieulerne and her coworkers donned hairnets and aprons and offered samples to patrons of one of the stores for the two new products: their Fire Roasted Tomato, Pineapple & Mango Salsa and a Mandarin Tangerine BBQ Sauce. Dieulerne said it was a hit. John Paul, or “JP,” is a business mentor with the finance and accounting departments with Taste of Immokalee. He has overseen Dieulerne for the past few months, working with her and two other students in the accounting department on a daily basis over the summer. And while one of the tangible results of a summer of work has been that Dieulerne can now use Quickbooks, Mr. Paul said the intangible benefits are perhaps more important. “I’ve seen growth. She’s more confident to speak up, more confident to talk about the products, more confident to talk about what we’re doing,” he said. “And knowing what you’re doing, it also brings an element of confidence that will carry over to other areas of school.” During the school year, students spend time on weekends and after class to run the business, but the bulk of the work is done in the summer when they spend 4 1/2 hours a day four days a week at work. The students are paid, like any part-time job, which allows them to truly focus on the business while gaining valuable realworld experience. Students leave the program with an understanding of their own department — whether that’s accounting, marketing or sales — and a big-picture, working knowledge of running a business. Dieulerne said that while she entered the accounting department with Taste of Immokalee because she excels in math, she plans to go in a different direction when she graduates. Dieulerne is one of a few dozen students, some as young as sixth graders, involved in the business. Proceeds from some of the sales go toward scholarship funds for Immokalee students and community relief groups. Taste of Immokalee products are sold at Publix in Collier County and online at www.TasteofImmokalee.com. Mr. Paul said the plan is to expand to stores in Lee County, and later throughout Florida.